Interested in an Inishbofin ecotourism experience? Check out Cultúr na nOileáin Walking Tours. Please consider donating to the Irish Whale & Dolphin Group. 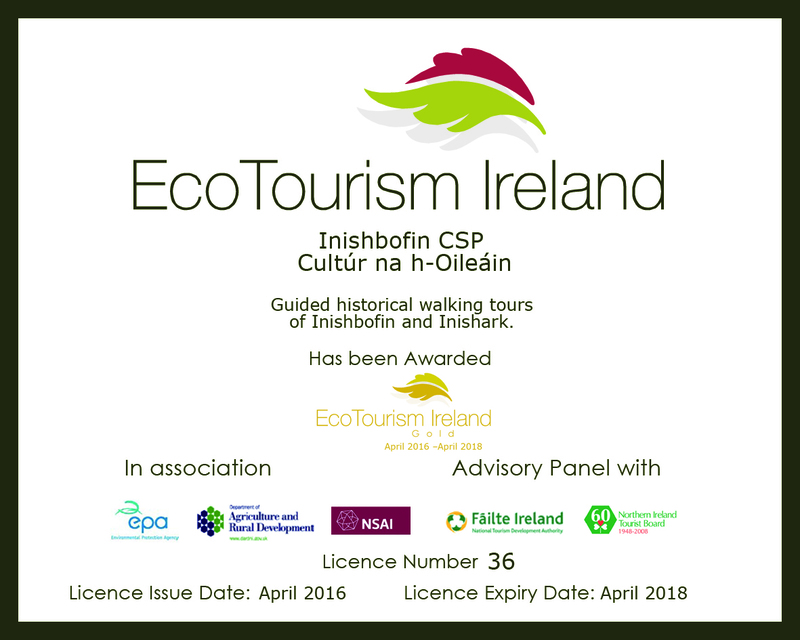 Visit EcoTourism Ireland and the International Ecotourism Society for more information. 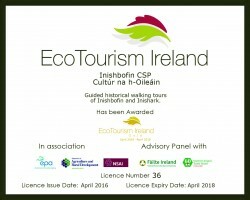 Inishbofin Community Centre is a Gold Certified EcoTourism Ireland operator. Currently there are reminders about minimising use of water & electricity throughout the building, especially in the bathrooms and kitchen where most water is used. At present the policy of recycling is in operation and Inishbofin Community Centre will continue this policy. Batteries & ink cartridges are recycled. Rubbish is sorted into three parts: landfill, paper & cardboard which are recycled, and bottles & cans which are take to the bottle bank. Composting was always done at the centre but after a recent storm the bin disappeared. A new compost bin was purchased in Dec 2015 and is now in use. We are in the process of changing our outside lighting to solar lights. A new Green Purchasing Policy has been developed by Inishbofin Community Centre. One of our main commitments is to only purchase 100% Recycled paper from our office supplies partner, Viking Direct. Brenda Burke, Community Centre Supervisor, produced a wonderful storage box from recycled pallets which is used in the reception in the community centre. Brenda and Kevin Abeyta, another Community Centre staff member, have between them produced benches and tables from recycled pallets which we use as furniture in our visitor reception area of the Community Centre. Inishbofin Community Centre will revisit the issue of replacing our current showers with more eco-friendly electric showers in mid 2016. Currently we provide timers so people can be aware of their responsibility to not spend too long using water. All Community Centre staff have completed Leave No Trace Awareness Sessions. For the coming season, we will sell products for John Francis Day—coasters, cheese boards and place-mats which are made from recycled slates from houses on the island. Two bird tables (made by a member of staff Brenda Burke) are being installed at the Community Centre. An insect hotel is going to be built at the side of the Centre. This will be ready for March 2016. The CSP, CDP & the Tourism Committee won joint first prize for Clean Coast Group Coast Boast: Joint Winner – Inis Oirr and Inishbofin (Cleaner Communities Nov 2015 Galway Co.Co) Brenda Burke CSP applied & coordinated the project. Inishbofin Lotto has approved a grant of 1000 Euros to purchase a washing machine & dryer. This was used to purchase economical coin-operated machines. Cleaning products used in the Community Centre are all made in-house using vinegar, water and lemon juice. This helps us reduce the amount of plastics we are bringing in to the building, as well as reducing the cardboard we import which cleaning products are packaged in. Our ecotourism experiences are based almost completely in nature, aside from brief registration and pre-walk information in the Community Centre. We want people to enjoy the beauty of the island’s landscape and to explore it responsibly. We seek to make people aware of the importance of Inishbofin and Inishark’s biodiversity, and what features are protected under special designations. This will include information on native wildlife and flora which may be encountered along the routes, for example our wide variety of birds, including the Corncrake, and also the population of Grey Seals, for which Inishbofin is a Special Area of Conservation (SAC). Other contributing features to our SAC will also be identified to participants on our tour, including our wonderful example of a coastal lagoon (Lough Bó Finne), and our dry and wet heaths which are also protected. We use a dedicated local guide to lead two of our ecotourism experiences. Tommy Burke is a native of Inishbofin and an expert on local history and archaeology. He has a higher diploma in Archaeology from NUI Galway and is also a working farmer on the island who has lived here his whole life. Tommy has for several years worked on the “Cultural Landscapes of the Irish Coast” project with academics from Notre Dame University. As a result of this he can provide you with a unique archaeological and cultural insight in to this beautiful deserted island, which lies just west of Inishbofin. Tommy personally unearthed a 14th century cross-slab during an archaeological excavation on Inishark. Tommy has many years experience as a tour guide on Inishbofin, and also as an employee of the island ferry, and through this he has a keen understanding of what people are looking for, what island information they find most interesting and also how to keep his tours relevant and entertaining. He has both the local knowledge and the academic grounding to offer a very well-rounded experience to the visitor and has dealt with many different nationalities and types of visitor. Our third ecotourism experience is a ‘Wildlife Detective’ programme for children. Through the provision of this we hope to educate all visiting children, as well as island children, about the animals and plants they encounter on Inishbofin. We hope this will instil awareness at a young age of our island’s biodiversity and that these children will grow up appreciating and helping to protect all that we hold dear of the island’s nature. Cultúr na nOileáin Walking Tours provide the most environmentally friendly way of exploring the islands. Both Inishbofin Community Centre and Tommy Burke are members of the Inishbofin Leave No Trace network. All his guided walks keep to the Leave No Trace ethos and adhere to the minimal impact walking codes. We also ensure our group sizes and not more than 25 people so as to avoid any negative impact on the environment. Our walks keep to existing routes. Inishbofin Community Centre and Tommy Burke are both contributors to the Inishbofin Conservation Initiative (ICI), which was created to fund island conservation projects including the Save the Dunes project and also the island Meadow Restoration Project. Cultúr na nOileáin promotes and donates to the ICI and encourages consumers to do likewise, while educating them about the good work which is being done and the need for funding. This Experience hopes to bring a direct funding source to the Inishbofin Conservation Initiative. 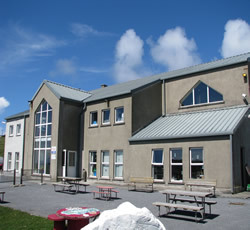 Inishbofin Community Centre is a member of the Irish Whale and Dolphin Group. Visitors will also have the opportunity to leave a donation to relevant charities at the Community Centre including Birdwatch Ireland. Cultúr na nOileáin will highlight the endangered species on the island during all walks, including the corncrake and the lapwing. Inishbofin Community Centre directly employs 10 local people, and will also be using local tour guide Tommy Burke. All our prospective customers will use the Inishbofin ferry which is owned and operated by a local family and employs local people as crew. In our reception area we will be advertising all activities run by other ecotourism operators on the island. We sell local-made art, crafts, music, books and clothing in our shop. The Inishbofin Community Centre is committed to ensuring each and every visitor to Inishbofin has the most enjoyable and entertaining time on the island. We aim for excellence in the provision of our own eco experiences, and we also provide any assistance necessary to visitors from our information desk and from our Tourism Office. We will survey all willing participants on our eco experiences and constantly look for ways in which we can improve our product for future customers. We also have Facebook, Twitter and Instagram pages for people to share experiences and give feedback from their time here. Our TripAdvisor page is being worked on and will be ready for the start of the visitor season in March 2016. Cultúr na nOileáin will be marketed and advertised across a range of media. It will have a dedicated website and Facebook page, and also as a result of the partnership between Tommy and the Community Centre, it will be marketed through the official Inishbofin website and social media pages (Facebook, Twitter, Instagram). In addition, there will be physical signage and advertising (made using recycled materials) on the island to direct visitors to the Community Centre as the base for Cultúr na nOileáin tours. 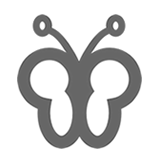 All marketing and advertising will promote the ethos of Leave No Trace, of which the joint operators (Inishbofin Community Centre and Tommy Burke) are partners. Any printing that needs to be done in the provision of our ecotourism operation will use 100% recycled paper sourced from Viking Direct. We treat all visitors equally and enjoy learning about other nationalities and finding out what it attracted them to Inishbofin. Most importantly, we have a love for our island and wish to share it with visitors. We want to teach people about our heritage and our culture, and make them aware of all the things that make Inishbofin such a special place to visit and to live. The Community Centre is full of photographs of families and inhabitants of Inishbofin going back to the start of the last century. We have a genealogical display linking the island with various parts of the world where descendants are living. We especially welcome people tracing their roots on the island at the Community Centre and offer any help or information we possibly can. We advertise and promote all island events online and in our reception area.